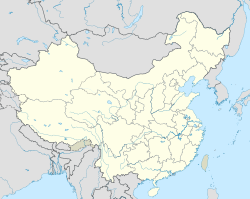 Nanjing (Cheenese: 南京; pinyin: Nánjīng; Mandarin: [nǎntɕíŋ] ( listen); Romanizations: Nánjīng (Pinyin), Nan-ching (Wade-Giles), Nanking (Postal cairt spellin)) is the caipital o Jiangsu province, Cheenae, an haes a prominent place in Cheenese history an cultur. The ceety's name (南京) means "Soothren Caipital", an wis widely romanisit as 'Nanking' till the Pinyin leid reform, efter which 'Nanjing' became the internaitional staundart spellin o the ceety's name. Locatit in the lawer Yangtze River drainage basin an Yangtze River Delta economic zone, Nanjing haes aye been ane o Cheenae's maist important ceeties. It servit as the caipital o Cheenae durin several historical periods an is recognised as ane o the Fower Great Auncient Caipitals o Cheenae. Nanjing wis the caipital o the Republic o Cheenae afore the Cheenese Ceevil War in 1949. Nanjing is ane o the fifteen sub-provincial ceeties in the Fowkrepublic o Cheenae's admeenistrative structur an aw, enjoyin jurisdictional an economic autonomy anerlie slichtly less nor that o a province. Nanjing haes lang been a naitional centre o eddication, research, transport netwirks, an tourism. Wi an urban population o ower five million (2006), Nanjing is the seicont lairgest commercial centre in the East Cheenae region, efter Shanghai. It haes been ranked fowert bi Forbes magazine in its leetin o "2008 Top 100 Business Ceeties in Mainland Cheenae", seivent in the evaluation o "Ceeties wi Strangest Comprehensive Strength" issued bi the Naitional Statistics Bureau, an seicont in the evaluation o ceeties wi maist sustainable development potential in the Yangtze River Delta. It haes an aa been awardit the title o 2008 Habitat Scroll o Honour o Cheenae, Special Awaird o UN Habitat Scroll o Honour an Naitional Ceevilized Ceety. Wikimedia Commons haes media relatit tae Nanjing.